This new audit process under the Affordable Care Act (ACA) affects commercial insurers. This audit under the ACA affects commercial insurers and is currently underway. An Initial Validation Audit (IVA) is required for commercial risk adjustment health plans as part of the Affordable Care Act. Selecting a highly qualified IVA entity is one the most important decisions you will make in the HHS-RADV process. The accuracy of your results will have a significant impact on your plan’s financial performance. The HHS-RADV program will transfer funds from plans with lower risk scores to plans with higher risk scores in the individual and small group markets, both inside and outside the Health Insurance Exchanges. Issuers in states where HHS operates the Risk Adjustment (RA) program are required to engage an Initial Validation Auditor (IVA). The Initial Validation Audit (IVA) is a two-phase, regulatory audit required by the US Department of Health and Human Services (HHS). For benefit Year 2017, Issuers (non-grandfathered) operating on and off the Health Insurance Exchange with more than 500 billable months per HIOS ID are required to participate in the IVA and must partner with a qualified IVA vendor to conduct the audit. 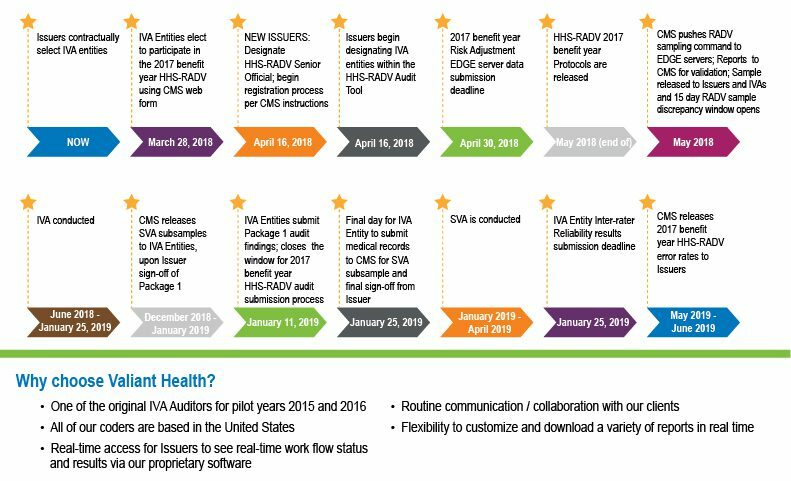 HHS-RADV: Hiring an initial validation auditor. The partners you choose to prepare you for the Initial Validation Audit are essential for determining your plan’s risk score and avoiding costly errors. Selecting your Initial Validation Auditor (IVA) is one of the most important aspects of preparing for HHS-RADV. These are 10 insights that should be considered when selecting an IVA partner. 1. Expect health plans and provider claim data audit experience. Experience in working with a health plan and familiarity with provider claims is essential in choosing your IVA. An auditing partner must be able to analyze claims data and confirm that claim submissions accurately represent the services provided to Plan members. 2. 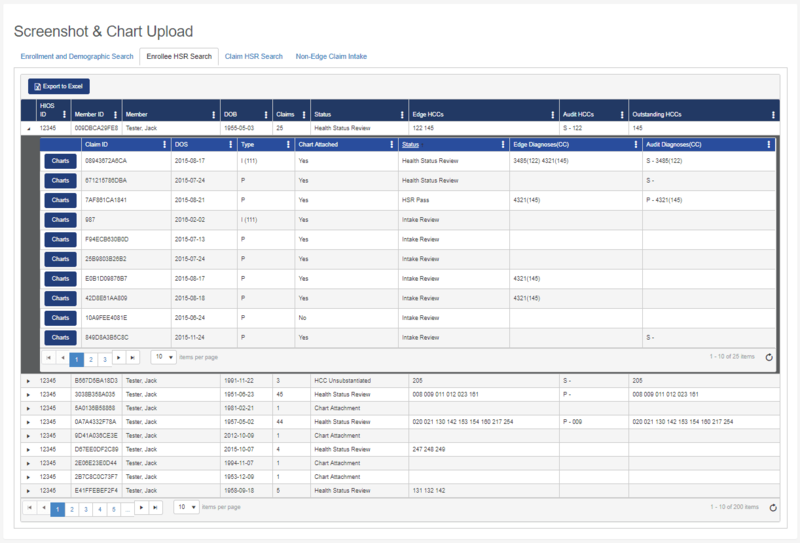 Consider medical record auditing capabilities. The auditor must be capable of performing the initial validation audit free of conflicts of interest. Issuers must attest to the absence of conflicts when they notify HHS of their auditing partner. 3. Validate risk adjustment expertise. Following the direction of the Department of Health and Human Services, an IVA must fully grasp the implications of the Commercial Risk Adjustment Model and how the score is calculated in order to effectively serve a health plan. To evaluate the plan’s data, the IVA must be able to break down the risk model to account for all variables that contribute to the final score. 4. Insist on customizable audit services. A one-size-fits approach will not work with many health plans. When evaluating a potential IVA consider how flexible the partner can be with your needs, budget, and resources. 5. Seek comprehensive audit services. While a one-size-fits approach will not work, a “one-stop-shop” partnership will allow you to form a long-term partnership with a partner who can work with you on all levels of the Initial Validation Audit phase. Services like a readiness evaluation or a mock audit could prove crucial to the success of the risk adjustment process. Be sure to consider whether or not your potential IVA partner can service all of your needs in the IVA phase. 6. Verify independence and absence of conflict of interest. The medical record review is perhaps the most important component of risk score substantiation. An IVA with clinical staff and experienced coders can best serve a health plan because of the knowledge and expertise required to accurately and appropriately review medical records. If not planned and budgeted for appropriately, the Initial Validation Audit process can cause health plans to incur significant costs. When reviewing contracts and proposals from your potential IVA it is important to understand how they will charge for services. Issuers should understand what is included and how much each service costs. The IVA partner you are considering may have a range of experience, possibly even in other industries. It is important for health plans to evaluate what previous experience may be valuable in serving as an IVA. 9. Asses ability to meet expected time frames. As the various stages of the process take place, your IVA must be able to comply with established deadlines in order to prepare for the Second Validation Audit. 10. Verify coding accreditations and certifications. If an IVA partner is not properly experienced and accredited, the potential for further risk is increased. Audit reviews must be performed by certified medical coders (AHIMA or AAPC).